To add a bit of fun to your playground or child-friendly space, playground spring riders from PlaygroundEquipment.com can bring a smile to any child's face. The multitude of options and cheap prices can make adults smile, too! Here, you can find many different shapes and sizes of spring rider playground equipment, from one-seat riders, to seesaws, to bouncing platforms. Whether you're looking to add something to a public park, enrich a local playground, or bring joy to a local daycare or church, you can find the playground spring riders that are right for you and your project. There are many different options available for playground equipment. Spring riders add a fun, new element that everyone can get excited about. 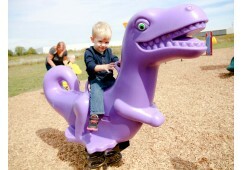 Children can bounce along while riding an animal, insect, or vehicle. Public schools looking to add something special may benefit more from our bouncers that allow multiple children to ride along, such as our seesaws. If a local school's space or public park needs something a bit more, these can add more fun to the experience. Public parks, daycares, and church facilities will often benefit from single spring rider. Playground equipment comes in many different sizes, just like those who enjoy it, so those looking to find a few, small, safe options for children have come to the right place. With PlaygroundEquipment.com, you'll find many different options for sale, which can all be delivered at an affordable price. PlaygroundEquipment.com is a name you can trust. We offer affordable, safe playground equipment. Spring riders offer a bouncy option for younger kids and can be ordered online today. As you can see, we have many different options, so feel free to contact us to find which option might be best for your public or commercial space. To find out more, feel free to contact one of our representatives or call 1-800-667-0097. You can also put whatever playground spring riders that you like into your quote cart and receive a formal quote.